Andrew – I have something similar going on with a job board buying my data from a third party in Pakistan of all places and then spamming me and processing my CV into their system. Needless to say I have never heard of them or dealt with them before, or given my consent. The comment that ‘our client will vigorously defend the action and we shall seek a costs order against you’ seems to be a standard ploy in these cases. There’s a lot at stake or they wouldn’t bother to defend them. I had a similar experience with William Hill. The difference was that I had no previous relationship with them as I had not been a gambler. Your experience is very useful as I may be able to reopen a claim against them which the judge considered to be ‘unreasonable’ and struck out (this was before a trial). The law on gambling and personal data seems to be stricter than on other goods and services. I do not yet know if there is a way that this can be turned to one’s advantage. This is very much a standard approach – However if you are about to instigate a claim for damages be sure that you can substantiate those damages to a judge (i.e. explain each item and let the court decide which of the items is recoverable). Aggression is the initial legal tool, be worth you looking up the “litigant in person” guidelines though. I recently settled out of court with MyJobMatcher for an infringement of DPA & PECR, I sought damages and – although the claim was settled without admission of liability – I had already listed those items which amounted to the nominal damages I named. It wasn’t a trivial matter and was quite a lot more extreme than most spammers. I’ll blog separately about this over the weekend (children / xbox permitting). I also used to be a development manager at bet365, working closely with the affiliate programme there. What is interesting here is the relationship between firm and affiliate – at bet365 we were banned from using the facilities, so to speak, so we could not gamble or become an affiliate during our employment (But there would be nothing stopping us from becoming an affiliate of William Hill I guess – the complication there would be that information security would be a concern for the employer). I’m pretty sure the opt-out in the affiliate scenario may be legally under the responsibility of the affiliate – you would need proof of collusion I think? 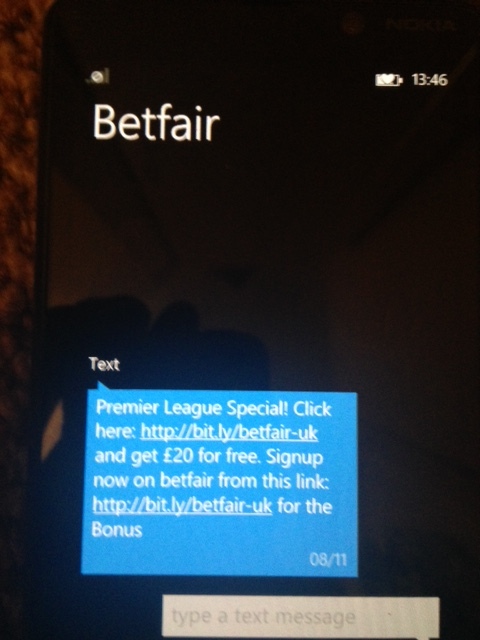 However the text message is representing itself as being sent from Betfair, which may have a different slant on it. The affiliate isn’t the main firm despite the contract between them and may not necessarily be held accountable.